“Autopilot-Autopilot” sounded through the cockpit speakers as First Officer John DePaola assumed manual control of the Embraer 135 regional jet. His left hand palmed the white-knobbed thrust levers; his right encircled the ram’s-horn-shaped control yoke. The 37-seat aircraft sliced through the placid air. American Eagle flight 4539 had departed Toronto at 7 a.m. Boston’s suburbs unfurled below an hour later. Instructions from Logan Airport’s tower cleared the flight to land on Runway 22L. DePaola peeked over the glareshield; bronzed haze still veiled the landing surface. His instruments would have to guide him a bit further. Captain Rich Joslyn pulled the wheel-shaped lever out and downward. A whooshed roar filled the cockpit as the nose gear doors opened into the slipstream. The electronic airspeed tapes trended toward the Embraer’s final approach speed of approximately 130 knots. With every seat filled, the aircraft was near its maximum landing weight of 40,785 pounds. Its fuel tanks were also flush with Jet-A—two hours of excess kerosene. When Joslyn called the runway in sight, DePaola saw Boston’s skyline jutting beyond the runway’s markings. He coaxed the throttles forward as the Embraer settled into its final approach configuration. The landing gear indications changed from white-blocked icons to green. Runway 22L loomed ahead; its inviting pavement beckoned DePaola and Joslyn lower. Air traffic controller Nunzio DiMillo meanwhile peered through Logan Tower’s slanted glass. The airport’s configuration resembled a giant puzzle board from the tower’s 285-foot perch. It was busy that June morning in 2007. Including American Eagle 4539, nearly 100 aircraft would take off and land within the hour upon Logan’s intersecting runways. DiMillo had been an air traffic controller for 25 years. He was working the West Local position; six other controllers manned the Tower’s remaining posts. 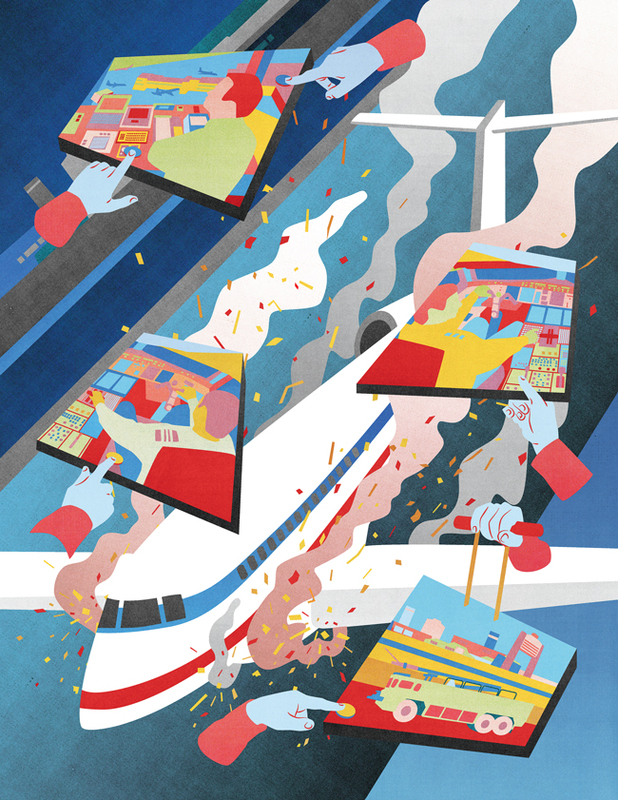 Just as pilots scan their instruments, the controllers’ eyes tracked the airport’s surfaces. Even when an aircraft is seconds from touchdown, tower controllers look downfield to ensure the runway is clear of traffic. They’re not necessarily observing an aircraft’s actual landing. DiMillo shifted his scan. His right thumb pressed his headset’s push-to-talk switch attached to his jeans pocket. The cadenced instructions were a metronome all his own. Behind him, flight 4539’s landing lights dipped lower through the tower’s windows. A triple-chime has a singular meaning in modern flight decks: WARNING. When the attention-grabbing dings sounded in the Embraer’s cockpit, DePaola and Joslyn eyed the central display unit. “LG/LEVER DISAGREE” was displayed in red upon the black screen. Joslyn reached for the hefty Quick Reference Handbook (QRH) and its abnormal condition checklists. Joslyn flipped the plastic-ringed pages and began reading aloud. “LG/LEVER DISAGREE” signified that the landing gear handle’s position didn’t match actual landing gear position. The checklist’s objective was simple: Achieve three green indications to ensure the gear was down and locked. “We got three green,” Joslyn said. He verified the handle was down; he re-verified the gear’s indications. Joslyn read the procedure a second time. There had to be a glitch within the aircraft’s countless computers. He then asked DePaola if the controls felt normal. The aircraft nimbly responded to DePaola’s inputs. He had 3,000 hours in the Embraer; Joslyn had even more. Aircraft cockpits fine-tune a pilot’s senses—the slightest abnormality registers. DePaola had heard the “cannon” of the opening nose doors; he felt the aircraft decelerate with added drag. The pitch and thrust settings were normal. Two key warnings were also missing. The landing gear horn hadn’t sounded; nor had the EGPWS (enhanced ground proximity warning system). The computer would have continuously announced “TOO LOW GEAR” if it were still retracted. “I think we’re alright with three green,” Joslyn said. The landing checklist was completed as Joslyn read the required items—including re-verifying the landing gear’s indications. DePaola pulled the thrust levers back against their stops; the tail-mounted Allison engines idled. The Embraer skimmed above the runway in ground effect—lift steadily dissipating from its splayed wings. The Cessna 152 glided above central New Jersey sometime during the mid-1980s. Its Hartzell propeller slowed as the tachometer’s needle slipped below 1,000 RPM. The cramped cockpit fell quiet. Student pilot John DePaola ensured the carburetor heat was pulled; the magnetos were on both. He tugged on the elevator-trim wheel. The Cessna pitched for best glidespeed. Cars bustled below the wing struts. The “nearest airport” feature on GPSs and APPS was far over the horizon. The two-seat trainer’s worn seats and fixed landing gear were an early prelude to the jets DePaola would eventually pilot. Triple-chimes and EGPWS weren’t even a glint in the Cessna 152’s plastic windshield. Yet the law of primacy transcends time and aircraft; what pilots learn first is often what they learn best. Gary Cox admonished DePaola on Trenton Airport’s ramp after each lesson. Trust your instincts and your training, he advised. Don’t ignore that seat-of-the pants feel. In the mid-1980s, Embraer had not yet built its first regional jet; the runways at Boston Logan Airport harbored Boeing 727s and L-1011s belonging to defunct airlines such as Eastern and Pan Am. Air Traffic Controller Nunzio DiMillo was in the Air Force; Captain Rich Joslyn wasn’t yet employed at American Eagle. The professionals’ lives wouldn’t intersect until decades later. DePaola had no way of knowing that the culmination of his aviation lessons would occur upon Logan’s asphalt in 2007. Trenton’s 1980s Avgas-saturated ramp was his learning canvas; Boston’s grooved runways would be his ultimate test. DePaola manipulated the Embraer’s controls to hold the aircraft in its sweet spot—the place where tires softly kiss terra firma. The fuselage sunk lower; DePaola eased the yoke backward. Runway 22L’s black and white markings streaked by as the aircraft’s nose pitched higher. The gentle quiver of a greased landing remained elusive. DePaola eased the right wing downward; then he lowered the left. The main landing gear tires should have met the asphalt. “Doesn’t feel right, doesn’t feel right,” he blurted. His peripheral vision glimpsed the runway’s pavement creep higher in the cockpit’s side window—a menacing tide rising above a sinking ship’s porthole. DePaola felt his left arm shove forward against the throttles. Slowly, the cockpit loudened as the Allison motors awakened from their idle slumber. DePaola willed the turbines to spool as his knuckles flushed against the yoke’s grip. He could only hope that it wasn’t too late. Pavement rose higher in the windows; the Embraer was about to be swallowed by the blackness. In the age of aircraft spotters, flight 4539’s peril was photographed. The Embraer passes above Runway 22L’s white “thousand-foot” blocks in the first shot. Its nose gear doors are open and the flaps are fully extended; yet its landing gear was entirely retracted. The second photo shows the Embraer scraping the runway. Sparks trail its underside; the fully extended flaps brush the asphalt. DePaola’s silhouette can be seen through the cockpit’s side window—his white shirt contrasting against the amber flickers. The yoke trembled in DePaola’s hand as the Embraer slid along the runway. There was a muffled scrape as the rotating beacon crunched under the fuselage. There was no smoke; no one yelled from the passenger cabin. DePaola set the throttles at about 60% available thrust. The “seat-of-the pants” feel instructor Gary Cox once heralded trumped the inclination to firewall the power. (Aircraft with tail-mounted engines pitch downward with increased thrust). The Embraer could have slammed nose-first into the runway if DePaola maxed the throttles. His eyes volleyed between his instruments and outside. He kept the aircraft’s pitch constant. As the surreal image of pavement meeting horizon remained unchanged, DePaola felt the yoke’s vibration subtly subside. DePaola briefly considered letting the aircraft settle on the runway—a potentially catastrophic choice. When (intentionally) landing gear-up, proper technique is to land as slow as practical—likely at least 25 knots slower than the Embraer’s approach speed that morning. Flight 4539 could have cartwheeled. There was also the aircraft’s ample fuel load. The 3,000 extra pounds could have turned the fuselage into a fireball. DePaola eased the yoke aft as he slowly added thrust; the pitch held steady. He eyed movement on his flight display—the vertical speed indicator’s green arrow ticked upward; the control column’s trembling ceased. As the Embraer freed itself from the runway’s grip, DePaola saw the pavement recede through the windows; he called for flap selection to 9 degrees. There was no need to ask for the landing gear to be retracted. The standard call notifies the entire Tower “Cab” when an aircraft initiates a missed approach. DiMillo looked to the southwest and saw the Embraer 135 climbing back into the sky. He ensured there were no traffic conflicts. Tower personnel soon realized the severity of what had transpired. Massport (the airport authority) reported aircraft debris scattered along the pavement. As the fire trucks rolled across the tarmac, DiMillo and his team knew an emergency landing was coming. Flight 4539 banked over the Atlantic Ocean. Air traffic control had radioed about the runway debris. There was also another problem: The aircraft’s flaps had jammed in the up position after dragging against the pavement. With or without the landing gear, the Embraer would make an abnormally fast approach and landing. As the waves rhythmically sloshed below, the past 20 years coursed through DePaola’s mind. The morning’s events unhinged his future. Hard work and dedication had always determined what came over the horizon. Now he couldn’t see his career progressing past the awaiting firetrucks. Nunzio DiMillo watched the rescue equipment congregate below. The stricken Embraer was approaching from the northeast. It would conduct a “fly-by” about 300 feet from the tower; DiMillo would ascertain through his binoculars if the landing gear appeared to be down and locked. DePaola reached below his left leg. The rectangular red door embedded within the cockpit’s floor contained the emergency landing gear extension controls. He flipped the panel upward. A compacted, broom-like red handle lay flush against the cavity’s grimy bottom; a guarded silver toggle switch protruded next to the rod. DePaola unclasped the protective covering. The QRH procedure instructed him to move the tiny switch to the “DOORS” position; he toggled to the “GEAR/DOORS” label three seconds later. A whooshed roar once again filled the cockpit. DePaola and Joslyn eyed the Embraer’s central display. The landing gear indications showed amber dashes; DePaola pursed his lips. He shifted his scan back to his primary instruments. When he re-eyed the landing gear indications, the blocks had turned green. DePaola and Joslyn shared a knowing look; they wouldn’t be fooled twice. The Logan Tower controllers would see the landing gear extended; or they’d radio unwelcomed news. There was nothing more they could do. Nunzio DiMillo raised his binoculars as he cleared flight 4539 to conduct its low approach to Runway 22-Right. The controllers around him continued transmitting honed instructions to other aircraft. Yet DiMillo could feel his colleagues’ penetrating glances reflect off the tower’s glass. DiMillo himself had seen aircraft crash during his career. The cartwheeling fireballs never left his seared memory. A controller’s greatest asset is his voice. Tone, pitch, and cadence move traffic. DiMillo knew the sounds of panic. The pilots of flight 4539 sounded poised and confident over the frequency. DiMillo half-turned to his colleagues; then gave a reassuring nod. He adjusted the binocular’s settings as the Embraer approached. His neck swiveled as he followed the low-flying aircraft. FAA rules prohibit controllers from making definitive statements regarding aircraft landing gear. “Appears up” or “Appears down” was all he could say. As the Embraer climbed, DiMillo keyed his headsets’ transmit button. He paused; his words had to be clearly understood by flight 4539’s pilots. “Your gear appears to be down,” he radioed. Joslyn and DePaola exhaustively briefed the pending no-flap approach to Runway 33L. They discussed the faster approach speed; they reviewed evacuation if the worst happened; the aircraft would stop on the runway regardless. The seasoned Captain made a final PA to the passengers and flight attendant. He then took control of the aircraft. (American Eagle/Envoy Airlines mandates that no-flap landings are a Captain-only maneuver). DePaola saw the emergency equipment lining the runway edges ahead. Nunzio DiMillo watched flight 4539’s final approach through his binoculars. The airport was at “Alert 2” so the local fire department had also sent its emergency trucks and equipment. The bulky vehicles would be the occupants’ salvation if the landing gear collapsed. Joslyn made his final adjustments; then pulled the throttles to idle. The Embraer once more glided above the pavement as excess airspeed bled off. DePaola stole reassuring glances at the landing gear indications. Joslyn agilely flared and made subtle rudder inputs. The Embraer was inches from touchdown—the very place DePaola’s gut instincts had surfaced. He exhaled when the familiar thud reverberated through the fuselage. Joslyn eased the yoke back to ensure the nosewheel also touched down softly. DePaola heard his voice almost turn giddy as he called out the deployment of spoilers and other landing-roll callouts. The aircraft slowed normally; there was no vibration or shimmying. Joslyn stopped the Embraer along the runway’s centerline. The aircraft wouldn’t move further—it would be towed to the gate. As for the Embraer, registered as N731BE, it was determined that a diode (costing less than a dollar) caused the landing gear’s malfunction. It essentially tricked the aircraft’s computer to freezing in the “down and locked” position. Damage to the aircraft totaled less than $25,000; it was repaired and returned to service. The FAA also issued an emergency airworthiness directive to Embraer 135/145 operators. DePaola resumed flying two months after the incident. Based at LaGuardia Airport, he wheeled his overnight bag and flight case through the terminal’s crowded hallways toward the assigned gate. It was his first flight since his Boston experience. Through the glass, the Embraer’s T-tail protruded above the jetways. DePaola felt his mouth gape into a half-smile as he slowly shook his head. N731BE was the aircraft’s registration number. DePaola marveled at the coincidence as the airline had a few hundred Embraer regional jets. Sometimes pilots and airplanes have unspoken bonds. DePaola walked down the jet-bridge. As he stepped on to the aircraft, he could not help but glance down at its landing gear. Bradley Sunshine is a corporate pilot for a Fortune 50 company and is a self-described “ultra-aviation enthusiast.” He lives in Chicago with his wife and daughter.